I am not a Microsoft employee, I have not even played a Microsoft employee on television. What follows is my own ideas on a what part of a future version of WCF RIA Services could look like. What I have been imagining is taking the existing DomainDataSource feature and splitting it up into a set of components that can be used selectively from a ViewModel, or used all together as the DomainDataSource control that you know. The PagedEntityCollectionView class would likely become public, as well as the EntityCollectionView. I'd also like to break the data loading functions out so that the logic used to submit the requests for loads and the response handling could be utilized from a ViewModel. The DomainDataSource manages situations such as hierarchical data and there's a lot of code involved to replicate that in a ViewModel--I'd love to see those functions exposed for easy consumption without using the DomainDataSource control in the UI. So I really see this item as a way to get the features of the DomainDataSource out of the DomainDataSource, and available to developers to use how they wish." Over the last two posts, I have been discussing ways that a ViewModel could present collection of Entities to the View. Of the options I presented only the PagedCollectionView is acceptable to me in the short term but in the long term there clearly has to be a better way. The other option which I hadn't previously mentioned is to build something new from scratch, an option that I have contemplated myself. The reason that I haven't is that I do not like duplicating logic that already exists and the fact that the PagedCollectionView and the EntityCollectionView already exist make me unlikely to want to write my own ICollectionView from scratch. To me, the best solution is to get the public EntityCollectionView that some of us have been talking about for a year now. Outside of a few old blog entries from Jeff and Brad you probably haven't heard of the EntityCollectionView. The EntityCollectionView is everything that the PagedCollectionView isn't. It is strongly typed, it supports the Entity, it supports IEditableCollectionView against an EntitySet, it supports external delegates to implement adds, removes, and deletes, and finally there is a PagedEntityCollectionView that adds RIA Services integrated paging support. Unfortunately, the current EntityCollectionView is internal and can only be used by the DomainDataSource. It will take lots of time to properly refactor the DDS and get all of the interfaces fully implemented, time that simply didn't exist for the initial release of RIA Services. Anyone who has been following the development of RIA Services knows the DomainDataSource was probably the most actively modified component of RIA Services right up to the end. They would also know that the DomainDataSource also the most monolithic parts of RIA Services. In the previous post I had a link to an overview of the ICollectionView. One of the issues with most implementations of ICollectionView is that sorting is slow due to reflection issues. Another issue that is specific to RIA Services is that for loading data we have the EntityQuery but for the ICollectionView we have the Filter and the SortDescriptions. Having two different methods of doing the same thing would be annoying. What would be better is the ability to supply the EntityQuery to the EntityCollectionView. This would allow the same EntityQuery to be used for the load and the filter. The unknown here is if the ICollectionView.Filter and ICollectionView.SortDescriptions should still be implemented or not. The SortDescriptions could probably be derived from the EntityQuery (and the reverse) but the Filter is tricky. The ViewModel needs to be the owner of the EntityCollectionView and control of insert, deleting, and paging. In many cases, the EntityCollectionView can be left to default functionality but in others the ViewModel needs to provide the actual logic. A good example of this would be to look at how the EntityCollection is implemented in your generated code. That shows an example of how add and delete logic can be externally supplied. Unfortunately, this does mean that the constructor for the EntityCollectionView may end up being rather complex. It is possible that some kind of "controller" object may be needed that can be supplied during construction and held onto by the ViewModel. One of the biggest problems with the PagedCollectionView is that it is not strongly typed. The problem here is that there may be other logic within the ViewModel that wants to use the same CollectionView that the View itself is seeing. Without strong typing, this requires lots of type casting which is, at best, annoying. Yes, the need for paging is obvious, but it also important to keep in mind the type of paging that is needed. It is possible that in some situations that the paging is being done only against already loaded entities. Much like with the update and the delete, we need to be able to override the paging so that the ViewModel can override. This has been an interested three part series for me as it helped clarify some ideas that I have had for awhile. For this post in particular, if you have any scenarios that you think the EntityCollectionView needs to cover please let me know and I will see if I can modify the post to account for it. In the previous post I showed some of the ways that collections of entities can be exposed from your ViewModel. The load examples I showed was relatively simple as it demonstrated a simple load with no ordering or filtering and there was only a single load. In a more realistic example where ordering or filtering is being used and the EntitySet cannot be cleared between loads then only the PagedCollectionView and ObservableCollection will work. In this post, I will show a more full example of how you can combine WCF RIA Services, ViewModel, and PagedCollectionView to fully support filtering, sorting, and multiple loads. When the PagedCollectionView was created, a SortDescription was set, this ensures that the PagedCollectionView will always be correctly sorted. The load is not clearing the EntitySet so it is possible for customers from multiple states to be loaded at the same time but the filter on the PagedCollectionView makes sure that only the currently selected state’s customers is being shown. It is possible to get the same effect using the ObservableCollection but it requires refilling the ObservableCollection every time an entity is updated or inserted into the EntitySet which can cause problems for the bound UI controls. The most important thing that the PagedCollectionView gains you is a clear separation of concerns within the ViewModel. Any business logic code adding, deleting, or updating entities does need to worry about updating the UI, that is taken care of by the PagedCollectionView which is monitoring the EntitySet itself for those changes. The only thing that the PagedCollectionView cannot detect for itself is when the any external values used in the Filter are modified so you do need to keep track of that and call the Refresh method whenever that happens. Other then that, in the ViewModels that the above code would be a part of no other reference to the PagedCollectionView properties would be necessary. The same can not be said for any of the other options that are available. In the last part of this series I will be discussing what is coming in the future. For the most part combining WCF RIA Services with the MVVM pattern is easy. One area of difficulty is in exposing collections of entities from the ViewModel. This post is going to show some of the current possibilities including my favorite solution, the PagedCollectionView. In two follow up posts I will be discussing some more advanced PagedCollectionView examples and then some future possibilities. Matches example code from RIA Services documentation. LoadOperation.Entities is read only, so this is only suitable for read only applications. EntitySet does implement INotifyCollectionChanged so as it is updated the UI will be automatically refreshed. Exposing the EntitySet to the view, even hidden behind IEnumerable, gives the view too much access. Binding to the EntitySet means that there is no ability to filter, everything in the EntitySet will be bound to the UI. ObservableCollection is not read only so this code is not limited to read only applications. ObservableCollection does implement INotifyCollectionChanged so as it is updated the UI will be automatically refreshed. Every insert, delete, clear, detach, attach, and load within the ViewModel has to manually keep the ObservableCollection in synch. This makes it easy to get into situations where the ObservableCollection gets out of synch with the DomainContext. The worst case scenario here is that a deleted entity gets re-added as a new entity accidently because it hadn’t been removed from the ObservableCollection. ObservableCollection implements IList. This means that the built in add and remove for both the DataGrid and DataForm will be enabled even though any entities added or removed directly to the ObservableCollection will not be added or removed from the EntitySet. Marlon Grech has a good primer on the ICollectionView, I suggest you go and read his entry on them and then come back. Have a good read? Great, so now you know what ICollectionView does. Unfortunately, the classes demonstrated by Marlon are marked as internal in Silverlight so we can’t use them. Fortunately, we did get a consolation prize back in Silverlight 3: PagedCollectionView. PCV automatically refreshes based on the contents of the EntitySet. PCV has full sorting and filtering ability. This will be demonstrated in the second post of this series. The PCV’s implementations of IEditableCollectionView and IPagedCollectionView are not compatible with the EntitySet. However, the incompatibility is reported by the PCV so the built in add/remove abilities of the DataForm and DataGrid are properly disabled. The PCV is not strongly typed limiting its usefulness inside the ViewModel. ICollectionView includes a “CurrentItem” property which is used by bound list controls. For example, if two comboboxes are sharing the same PagedCollectionView for the ItemsSource then changing the selection in one combobox will cause the selection to change in the second combobox as well. None of the above options are perfect, but the PagedCollectionView is certainly the best option that we currently have. In my next post I will be discussing the PagedCollectionView in more depth and in the third post I will be discussing what the optimal solution would be. 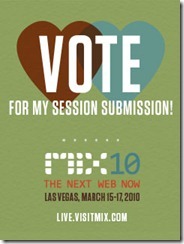 Earlier today Microsoft opened voting for the MIX10 Open Call entries. I am happy to see that at least eleven of the submissions mention WCF RIA Services. Even if you are not attending MIX10 it is still important that everyone posts as the sessions will be available on the web along with the rest of the MIX10 sessions. You can see all of the submissions here. As you can see, I have a pretty large stack of stuff that I have used so I will not be able to cover all of it in depth. If my session is selected I will be open to suggestions on what pieces I cover more than other pieces.